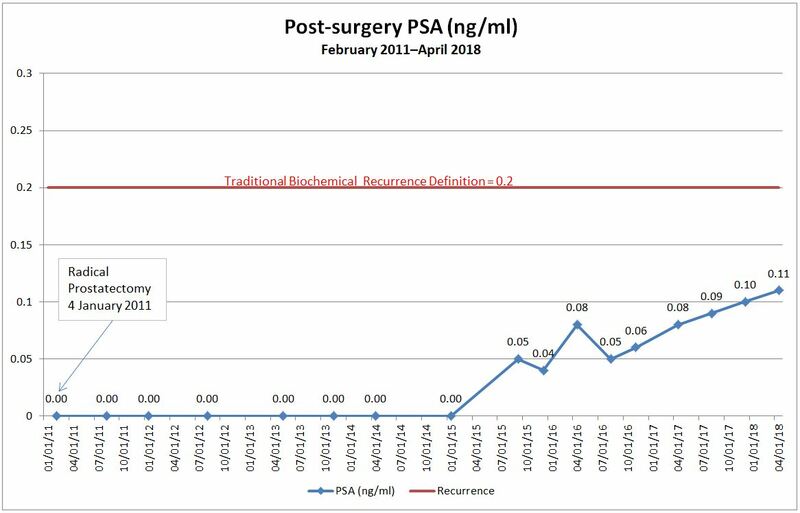 The bad news: My PSA continued its upward climb to 0.11 ng/ml. The good news: The rate of increase remained constant (and is still quite slow). The result is exactly where my spiffy spreadsheet said it would be, so I’m not overly surprised. All that’s left to do now is wait for my appointment with the urologist on 19 April. I’ll have to do my best to let him speak a little before I assault him with my already prepared list of questions. This result reinforces my belief that it’s time to bring a radiation oncologist into the discussion so I can get his or her perspective on salvage radiation therapy, especially regarding the risks of long-term side effects impacting quality of life and the likelihood of success. Sorry to hear this, but it’s not a surprise and you are ready for it. Looking forward to hearing how things go with the doc. Thanks, Jim. I’ll post an update after the appointment once I absorb all that’s been said. I am one of the 30% that radiation worked. I had a Gleason 9 and would be dead now if if had not worked. That was 13 years ago. However, you are right about the side effects of radiation treatments. Some of the effects were soon after while others were years latter. At the time I had the radiation treatments, I was told it was a 50% chance. Thanks for your comment and sharing your experience. We’ll see what the docs have to say over the next few weeks. If you don’t mind my asking, what are some of the long-term side effects that you’ve had, and how have they impacted your quality of life? If you don’t want to reply here, you can email me using the Contact link above. Thanks! Not the number you wanted. Hopefully the doc has an answer for you. Dan, sorry to hear. I had my appointment today, after a move up from .046 to .06. You might be interested to hear about my meeting so here’s the short version. Basically due to my good pathology, which is the same as yours, and “my low chance of recurrence” genomic score (have you had the Decipher test done on yourtumor tissue? ), doc said not to rush into treatment, do imaging when it breaks .2, if nothing shows on scans, and theerise remains slow , maybe even wait till it hits .4. He also said, he’s seen hundreds of guys get to .1, and not go higher for years. I’ll ask about imaging as well. I know that UCLA is running a PSMA trial, and getting there from San Diego would be relatively easy for me. Like you, I’m going to be very cautious and deliberate in my next steps. Dan, I’m not sure how long they hold the tissue, but it’s worth asking. The Decipher score can be very informative. I doubt any scan would show anything at .1. I think (could be wrong) that .2 is the lowest level that you could expect any scan to show anything. 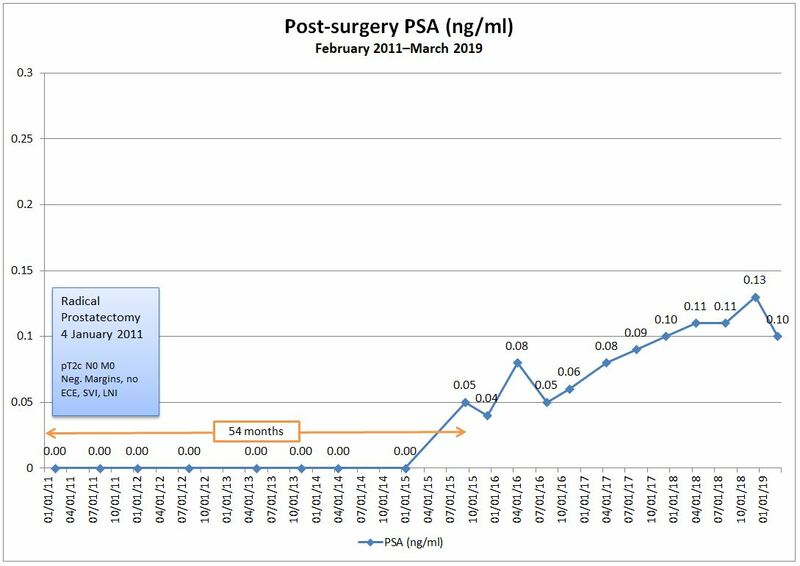 Hi Dan, my psa also rose a little this month, 0.1 now. I have a meeting with my onco on the 18th April, I’ll let you know what he says as our cases are quite similar, it’ll be interesting to cross compare our conversations! I was disappointed with my latest result, but like you, not surprised. Cheers for now and good luck with your meeting. Hi Adrian. Sorry to hear that your PSA crept upward as well. I’ll definitely want to compare notes with what our doctors say. My appointment on the 19th is with a urologist, and I’ll ask for the referral to the radiation oncologist then. It may take a while before we can do an apples-to-apples comparison. I haven’t deleted my Facebook account yet, so I’ll check out your page. Time to get ready for work. Keep in touch. Thanks for the heads up about the error! And for the comments on my work.